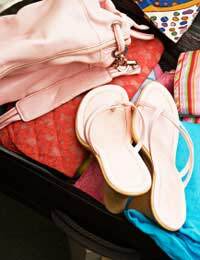 When you're packing your suitcase ready to go away on holiday, the thrill of a week or two away from the daily grind can often mean that you forget something really obvious! If you're taking anything valuable on holiday with you, including your essential items and anything of sentimental value, don't pack them in with your toiletries in the main suitcase, keep them with you at all times in your hand luggage. Camera, iPod, mobile phone, medicines and expensive jewellery items are all things you should keep close by. Most airlines have a specified weight, or size limit for hand luggage, so check this before you go. It's usually around 5 kg and a size that will easily fit under a seat or in an overhead compartment. Keep all of your travel documents (passports and visas, your holiday money, travel insurance documents, any travellers' cheques, your tickets) securely tucked away. Which Clothes Should You Pack? You have to be ruthless here. Lay everything you think you want to take out on the bedroom floor, and then put half of it back in the wardrobe. Consider where you are going; is the climate likely to be warm or cold? Do you need any specialist equipment (ski wear) or will you be hiring it out there? Pick out the essentials - swimming costume, underwear, basic t-shirts and jeans (depending on the climate) and then add a couple of 'going out' outfits. Pack enough underwear for at least a week and put a spare set of undies in your hand luggage - well your baggage might get delayed!Women should pack at least one long skirt or pair of trousers and something to cover the shoulders - in some countries you won't be allowed into certain buildings without covering up. Don't pack too many toiletries, you won't use them all. Shop around for travel size versions of your normal products. Don't forget travel wash - even if you intend to use the hotel laundry, you can wash your smalls in the sink! Remember to pack a first aid kit - just the essential items like an antiseptic cream, a few safety pins, headache tablets and 'holiday tummy' cures. Be careful with the headache tablets as some countries don't allow some drugs such as codeine into the country without a doctor's note, while in the UK you can buy them over the counter. Check before you go. The centre of gravity - if you pack all of the heavy items into the suitcase first, and then tip it up, you'll end up with the heaviest portion of the case all on one side which makes it harder to carry. Delicate items - protect them with clothes and keep them towards the centre of the case. With all this advice, you'll probably still find that you forget something you really should have remembered...and then don't wear some of the clothes you did take! this is a great list to refer to!